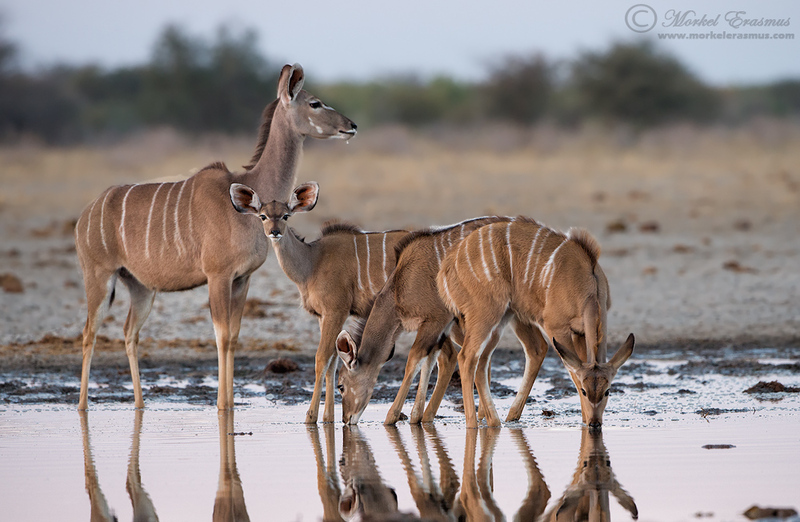 A herd of graceful and beautiful Greater Kudu approach the waterhole. Gregarious, as they ever are, big radar ears scanning around for the slightest hint of danger. There are young ones in this herd, and there's no bull present, so the ladies must be vigilant indeed! I sit motionless, my head, shoulders (and my camera of course) sticking out of a manhole made in the top of an underground concrete research bunker at this specific waterhole. 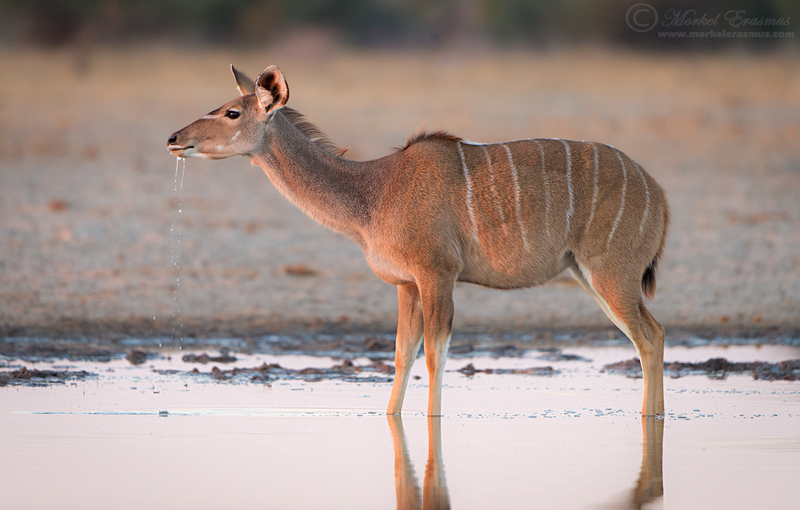 I have been sitting here for a while so the Kudus have no idea I am here - unless I chase them away by moving suddenly. As they approach the water, I gently move my camera and lens in their direction by shifting its orientation on the beanbag I am using for support. The light is very low, so I need to have very steady hands. I switch on my lens' Vibration Reduction (VR) for extra stability, and I switch my camera to the quiet shutter mode, so I can be as non-intrusive as possible . The herd eventually relaxes enough to start drinking their fill...but the vigilance never leaves them. Ears alert, heads popping up every time my shutter trips, females looking around for danger the whole time. But danger is far away on this morning...they have a good long drink, and eventually saunter off back into the bush in search of food. I relax, and take a deep breath as the sun peeks over the horizon. Moments like this is what it's all about...for so many it's just chasing those iconic species like lions, leopards, elephants...and yes of course I enjoy seeing and photographing them...but it's about so much more. Wildlife photography is about appreciating the diversity of Creation, the immense balance and beauty that exists in nature. It's an immersive experience, and one you need to be present for when you are in the field. As usual, the photos will display at best resolution and sharpness against a dark background if you merely click on them and cycle through with your arrow keys. Thanks for having a read of my blog! I hope you have a stunning day. I totally agree, one has to go beyond just searching for the most iconic species. It enriches your nature experience so much. Thanks for your comment, Vernon!